As a woman more familiarly known as “Queen,” Quanitta Underwood truly grasps that uneasy-is-the-head business. She doesn’t yet wear the crown – she’s one victory away from that. But as the poster puncher for the U.S. Olympic Team Trials for Women’s Boxing, the Seattle lightweight has been given most-favored status – and it hasn’t done her a bit of good yet. For the third straight night, Underwood had to fight from behind to advance – this time by an oh-so-narrow 25-24 count over teenager N’yteeyah Sherman – to Saturday’s championship round at Northern Quest Casino. Veteran flyweight Marlen Esparza of Houston and 16-year-old middleweight Claressa Shields of Flint, Mich., also triumphed in the winners’ bracket finals and get a day off to rest and prepare for the potential deciding fights Saturday night. If any of the three unbeaten lose then, however, there will be a boxoff Sunday to determine the U.S. qualifier for the AIBA World Championships in China in May. Olympic qualifying is contingent on a top-eight finish there, or being one of four additional boxers selected by a committee. Chances are, of course, that Saturday’s fights will be rematches – maybe every chance in the case of Underwood and Sherman. “I’m sure we’ll have to fight again,” Underwood agreed. And it figures to be bitterly contested. When the two met in the semifinals at last year’s USA Championships, a 23-23 draw was broken by total punch count – Underwood winning that 116-96. And after Thursday’s fight ended, Sherman raised her arms in celebration – and was animated in her disgust when the decision was announced. She did not speak to the media after the fight. It’s possible Sherman knew the judges’ scoring after three rounds and felt she’d done enough in the fourth to win. But Underwood’s punches were more direct and decisive, and the 6-foot Sherman had a tougher time getting her long arms unspooled for combinations. Underwood had trailed after the first round in both her previous fights here, and trailed this time by a point after each of the first three. And though she denied Sherman’s superior reach posed the biggest problem, Underwood knows she’ll have to make some adjustments if they meet again. Almost as close but not nearly as entertaining was Esparza’s 13-10 decision over New Yorker Christina Cruz – a counterpuncher first, last and always. But as she’d maintained earlier, Esparza wasn’t going to be lured into lunging into Cruz’s right hand, so the action was sparse. “That’s what she loves, when you just rush at her,” Esparza said. The key, Esparza said, is to get ahead early – and she did, barely: 2-1 after the first round, 9-7 going into the fourth. And the Shields-Hemingway bout was a complete departure – the bullish Hemingway trying to frustrate the teenager with as much grabbing, leaning and wrestling as punching. Shields won a clear 23-15 decision, but was intractably unhappy afterward. “I didn’t like the score,” she griped. “I could have sworn when I was in the corner he said 29-9 (after three rounds) or something? I never scored 23 in my life. 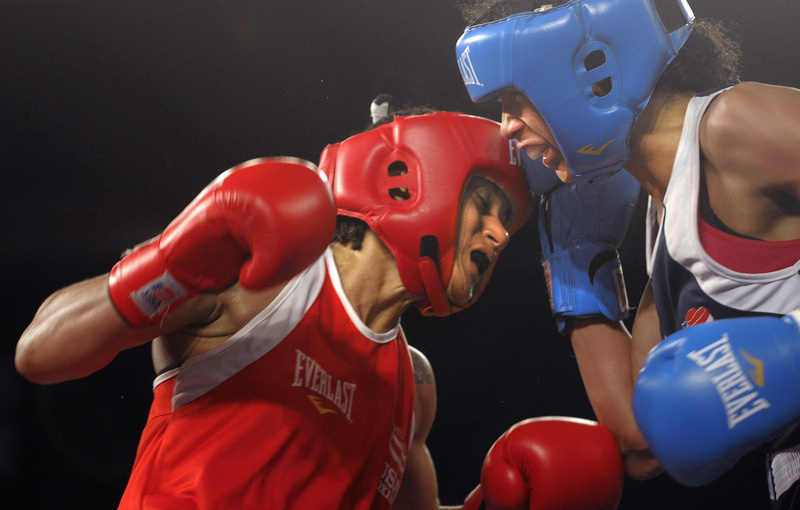 High seeds fell in two of the loser-out bouts – No. 1 middleweight Franchon Crews going down to Raquel Miller of San Francisco 26-15, and second-seeded lightweight Tiara Brown being ousted by another Californian, Mikaela Mayer, 23-18.